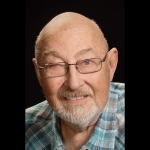 John W. Tritle Jr., 76 Kansas City, KS, died Wednesday, August 8, 2018, at the University of Kansas Hospital. Funeral Services will be held at 10:30 a.m. Tuesday, August 14, at the Porter Funeral Home, 1835 Minnesota Ave., Kansas City, KS. Burial will follow at Highland Park Cemetery. Friends may call 5:00 - 7:00 p.m. with Masonic Services at 6:45pm Monday at the Funeral Home. In lieu of flowers the family suggests memorial contributions to his grandchildren's activities: Andrew- Cub Scout Pack 92 or Abigail-Girl Scout Troop 1250 or Manhattan Monarchs Softball in care of the funeral home. John was born September 23, 1941, in Kansas City, KS. He graduated from the University of Kansas in 1966 with a Bachelors Degree in Business and was in the Army National Guard. He worked as a sales rep for Cook Paint for 15 yrs and sold insurance for American Family and retired from Allstate Insurance. John has been a Mason for 31 years and Past Master for both Delaware 96 and Wyandotte 3. He was a member of the KCK West and Pottawatomie County Kiwanis Clubs. John was preceded in death by his sisters, Jeanette Posten and Martha Cowan, son, David in 2008 and his wife, Barbara in 2014. He is survived by his daughter, Christine and husband Scott Chainey, Wamego, KS, grandchildren, Abigail and Andrew Chainey, and sister, Marilyn Harris-Goertz. So sorry to hear of John passing, but know he is not in pain and now with Barbara and his son. You are in my prayers. I know you will miss him. Just remember Jack is now without pain and in the arms of Jesus. Christine sorry to hear of your father's death. I regret not being able to attend lodge with him as we talked often of our respective Masonic Lodges. I always remember the Tritle family as your mom shared my wife's birthday , October 3rd, and you share our daughter,Kierstin\"s birthday, March 4. I have sent emails to some of your Mom's friends at work. Masonic services will be held at 6:45 p.m.